The famoose – mice with fairylike wings – are pretty little things, and helpful, although their need to feed on rotten teeth (taste like walnuts) to keep their wings in good condition, can be quite disconcerting at meal times. The fairy has taken many forms in myth and legend both good and evil. 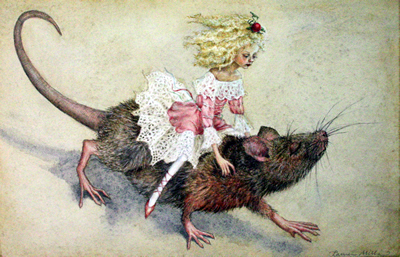 The fairies in Kimi’s world are based on one such legend, from 18th century France – the “tooth mouse” – a fairy tale in which a fairy turns into a mouse to help the good queen defeat the evil king. The mouse hides under the king’s pillow and punishes him by knocking out all his teeth. And so the tooth fairy was born – and so it seems were the famoose. Bentley pointed above Kimi’s head to where a dozen or more spheres of shimmering light the size of large oranges were descending through the leafy trees. Kimi saw wings, beautiful luminescent wings like swirling rainbows folded around a slender grey body. …the thing flung itself forward and landed on her chin. Its claws were on her lips, stretching her mouth open. The snout and beady eyes poked through the shimmer. The quantity of lanterns in the trees tripled, brightening their way considerably. Warm fruity aromas filled the air. Famoose played in the branches and a dozen or more flew alongside for a while. If Santa was real, then they could be in his grotto right now. Kimi felt lifted by it all.